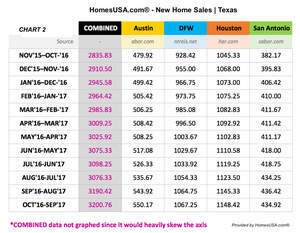 DALLAS, TX--(Marketwired - Oct 25, 2017) - New home sales and prices improved in Texas, but took slightly longer to sell in September, according to HomesUSA.com® New Homes Sales Index and other data released today. 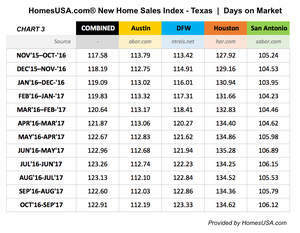 The Index is 12-month rolling average of the Days on Market for new homes listed in the local Multiple Listing Services (MLSs) for the four largest Texas markets, including Houston, Dallas-Ft. Worth, Austin and San Antonio. The pace of new home sales in all of these markets slowed a bit, according to the HomesUSA.com Index for September, as their Days on Market increased from August. In Houston -- the largest new home market in Texas -- the average Days on Market for new homes increased from 134.36 days in August, to 134.62 days in September. In Dallas-Fort Worth, the Days on Market increased from 122.86 days in August, to 123.33 days in September. 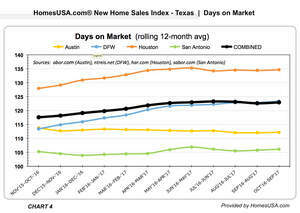 The Days on Market in Austin increased from 112.03 days in August, to 112.19 days in September. San Antonio's new home sales pace also slowed a bit, as the Days on Market increased from 105.79 days in August, to 106.12 days in September. Ben Caballero, owner of HomesUSA.com and the number one real estate agent in the U.S., notes the Texas data he released today is largely in alignment with the Commerce Department's announcement today on New Home Sales for September, which reported new home sales were up 19 percent nationally. "As we head into the fall, we will be watching for both the seasonal impact on new home sales as well as signs of Hurricane Irma's impact on new home sales," said Caballero. "Right now the news is good for home builders as new home sales are up, and good for buyers as home prices are down a bit," he added. 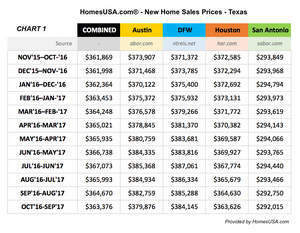 In the four Texas markets, new home sales continue to show strength, according to data compiled by HomesUSA.com from local MLS and trade associations, including the Houston Association of REALTORS®, North Texas Real Estate Information Systems, San Antonio Board of REALTORS® and the Austin Board of REALTORS®. The rolling 12-month average of home sales in these markets increased from 3,190 in August to 3,200 in September. In Houston, the average new home sales price dropped from $364,630 in August, to $363,626 in September. In Dallas-Ft. Worth, the average price dropped from $385,288 in August, to $384,145 in September. In Austin, the average price dropped from $382,759 in August, to $379,876 in September. And in San Antonio, the average price in September was $292,015, down from $292,750 in August. According to HomesUSA.com, based on a 12-month rolling average, Houston posted new homes sales of 1148.42 for September, up from 1145.33 in August. Dallas-Ft. Worth posted sales of 1067.25 in September, up from 1064.75 in August. Caballero notes the average Days on Market for New Homes "is about 65 days higher for new homes than for existing or 'pre-owned' homes." Why? "There's a huge difference between selling a new home and a pre-owned or existing home," Caballero explained. "New homes are often listed for sale during the early stages of construction. This early market exposure allows buyers the opportunity to customize the home. Plus, by placing more inventory on the market, as it is being built, expands the inventory of available homes, and that's especially helpful for buyers and agents in a tight housing market." Please note that the monthly data is based on information reported to the MLS that may be incomplete or subject to further revision by the MLS. While licensed real estate professionals are required to report closed sales to their local MLS in Texas within 72 hours of a closed sale, not all sales, unfortunately, are reported promptly and some are reported more than 30 days later. This late reporting causes the prior month's reported index number to change to include newly reported sales. Only the prior month index number is impacted and that number, once adjusted, is the final and correct index number. Ben Caballero is world's most productive real estate agent, ranked #1 in America for the last six years, according to REAL Trends as published in the Wall Street Journal. He is the first and only agent in U.S. history ever to exceed the $1 billion mark for residential sales transaction volume in a single year, accomplished in both 2015 and 2016. 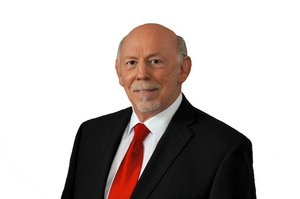 An award-winning innovator, Caballero is founder and CEO of HomesUSA.com®, Inc., working with more than 65 home builders in Dallas-Fort Worth, Austin, San Antonio and Houston. Learn more at HomesUSA.com.